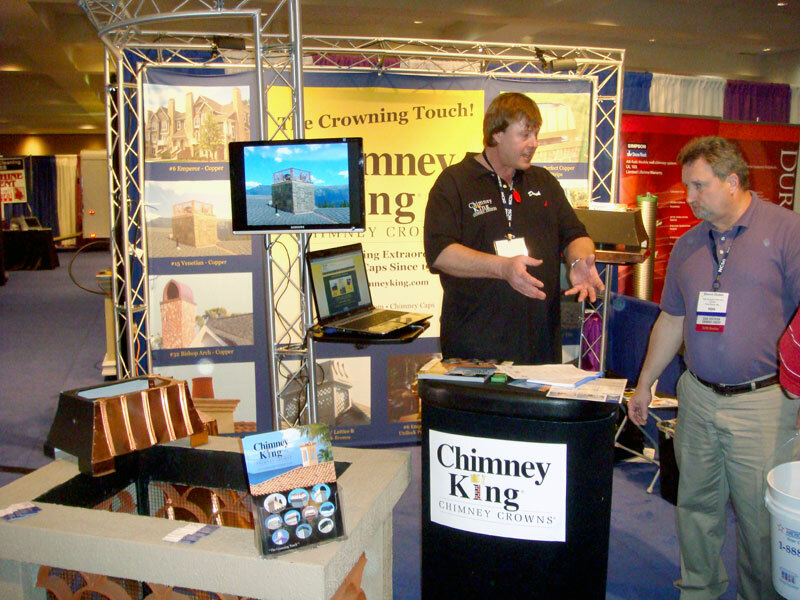 Chimney King is the leading manufacturer of architecturally inspired, custom sized, UL Listed & UL labeled chimney shrouds in the USA. Started in 1992 by Scandinavian homebuilder Derek Lidstrom, Chimney King has grown from 3 styles in 4 colors, to over 100styles in 64 colors and 13 different metal finish options thanks to the ideas and needs of our customers. It is our goal to make a chimney cap to suit every imaginable style of architecture in a high quality, complementary finish. Whether you need a copper chimney cap for your log cabin lake home in Idaho, a black chimney cap to match the roof and shutters on your colonial saltbox home in Maine, or a stucco finish chimney pot to accent a mission style home in Arizona – we can custom craft something extraordinary just for you. Our caps have adorned the Showcase Home at the 2002 and 2003 International Builders Show, graced the cover of magazines like BUILDER and Alternative Energy, and five of them sit atop the just completed Frank Lloyd Wright masterpiece ‘Massaro House’ in Mahopac, NY. (The Massaro House and its caps are to be featured in a PBS documentary coming soon) Our new ‘Desert Tiles’ design won 2nd place for best new product of 2009! We put our money where our mouth is. Big builders like Signature, Richmond American, Green Briar, Centex and Pulte have taken advantage of our ‘Free Caps for model homes’ promotion and sold more fireplace options because of it. Custom builders have taken advantage of our ‘50% off Parade Homes’ promotion and have given their homes a unique market advantage. Best of all, having a 10 year guaranteed, UL Listed & labeled chimney shroud on your home means that you have met the requirements for the 2000 International Codes – Mechanical - Residential - Fire - Fuel & Gas, as well as NFPA 211 and NFPA 54 for chimney shroud use. This keeps the UL Listing and factory warranty on your factory built (pre-fab) fireplace intact as well as your homes insurance policy!